Eunsung Cho is a Ph.D. candidate in the field of East Asian history. She is interested in analyzing both North and South Korean histories in relation to the larger context of modern world history. Her research topics include scientific discourses, developmental representations, nationalism, the relationship between linguistic symbols and social integration, and so forth. In particular, her dissertation examines how the successful industrial production of vinalon contributed to formulating the Juche [self-reliance] idea in the 1950s and 60s North Korea. Vinalon is a synthetic fiber developed by a Korean scientist. She received the GSAS International Research Fellowship, Harriman Russian Studies Research Grant, Florence Tan Moeson Fellowship from the Library of Congress, and so forth. She is a Mellon/ACLS Dissertation Completion Fellow now. She co-authored a book entitled The History of Chosŏn Workers’ Party of North Koreain 2008, Korea. A focal point of this book was to analyze how politics reinterprets history and formulates national identity over time, through a comparative study of four versions of the official history made by the ruling party. 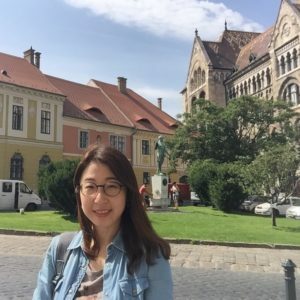 Eunsung received her B.A. in history from Yonsei University. After graduation, she worked for five years as a newspaper reporter and then served for a year on the Council for social transparency established under the Roh Moo-Hyun South Korean government. When she was a journalist, she covered politico-social affairs and specialized in analyzing the discourses produced by media from the conservatives and the progressives. Eunsung earned her M.A. in North Korean politics from the University of North Korean Studies, and M.A. in Asian Studies from the University of Texas at Austin.